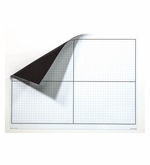 OptiMA is your number one source for more dry erase X/Y Axis or Cartesian Graph options than anyone. We offer a full line of framed magnetic and non-magnetic, an OptiMA original, XY axis boards, lap boards, combination boards and roll up magnets. If you can't find the right XY Cartesian graph product that your looking for there is always the option of making something custom for you. 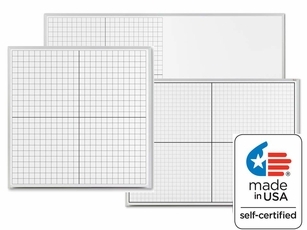 All of our Cartesian graphs are made with our exclusive clear dry erase writing surface that covers the graph so it will never peel, crack or flake off. Our lines are crisp and clean and the prints will erase completely for years to come with simple care and maintenance. 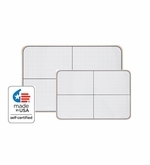 Every product is made in the U.S.A. and school purchase orders are always accepted. 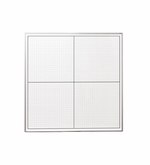 Available in Magnetic or non-magnetic receptive wall mounted units. 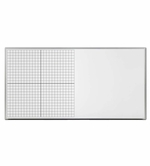 From "Options" "MA: 4x4 Non-Magnetic (+$229.95)" "HB: 4x4 Magnetic Receptive (+$299.95)"
Large Combination Board with X/Y Axis Print on the Left Side and Plain White on the Right. 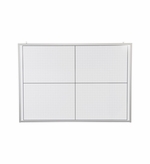 From "Board Options" "MA: Non-Magnetic Writing Surface (+$359.95)" "HB: Magnetic Receptive Surface(+$499.95)"
Smaller magnetic or non-magnetic receptive wall mounted units that ship UPS. From "Board Options" "MA: Non-Magnetic 32\" x 45.5\" XY Board (+$129.95)" "HB: Magnetic 32\" x 45.5\" XY Board (+$194.95)"